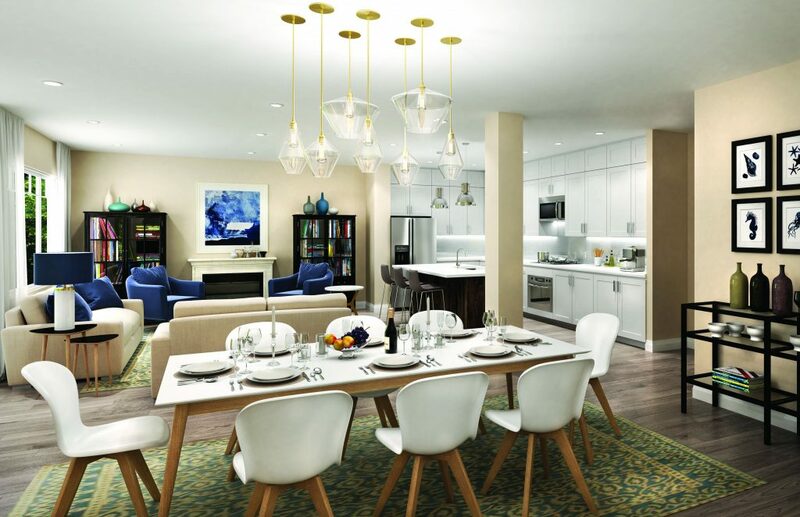 There are plenty of reasons to buy a new townhome or single-family home at Georgian Sands this December. New mortgage rules are set to go into effect January 1st, which will make it more difficult to qualify for a mortgage. Pre-construction prices at the Wasaga Beach master-planned community are also expected to rise in the New Year from $299,900. And given that the holidays are upon us, wouldn’t purchasing a new home be the perfect gift to give yourself? Residents of Georgian Sands can ride their bikes to Wasaga’s world-famous beach in less than 10 minutes, tee off at the neighbouring 18-hole golf course, or explore the soon-to-be-redeveloped downtown area. Additionally, shops, cafés and a four-acre park with a sports court are all within walking distance of the vibrant, family-friendly community. Georgian Sands’ collection of detached homes and townhomes were inspired by the natural beauty of Georgian Bay. The exterior designs are characterized by gables and turrets, shiplap siding, shakes and stone in a coordinated colour palette reflecting the sky, earth and water. The three and four-bedroom floorplans boast open-concept kitchens, comfortable great rooms and main floor powder rooms. Plans with formal rooms, libraries, mudrooms, home offices and second-floor laundries offer a custom feel, while indulgent upgrades such as freestanding oval soaker tubs or two-sided library fireplaces add an air of luxury. Wasaga Beach offers four seasons of recreation for outdoor enthusiasts. During the warmer months, hit the links at the adjacent golf course, swim or boat along the world’s longest freshwater beach, and hike or bike the local trail networks. Once winter arrives, head over to Blue Mountain in nearby Collingwood for downhill skiing, snowboarding or tubing. If you prefer more leisurely activities, try snowshoeing, cross country skiing or outdoor ice skating. Wasaga Beach is one of the fastest growing communities in Canada, and the downtown will soon be transformed with the addition of a new arena, library and mixed commercial and residential buildings. Plus, Georgian Sands is only a half hour from Barrie and under an hour from Brampton and northern GTA. An impressive selection of models are still available, but prices are set to rise in the New Year. Anyone who purchases a new townhome or single-family home before the end of the year will receive a 2018 membership to the golf club that abuts the master-planned community. You’ll be able to play unlimited rounds of golf at the 18-hole course prior to moving in to Georgian Sands — allowing you to become better acquainted with the neighbourhood and the putting green. To take advantage of this limited-time offer, be sure to register online. For more information, please visit georgiansands.com or email sales@elmdevelopments.com.